Lesbos, Athens, and northern Greece—In the baking midday August heat on the Greek island of Lesbos, Ziad Mouatash bounces out of an overcrowded inflatable raft and touches EU soil for the first time. The 22-year-old from Yarmouk—the Palestinian refugee camp on the edge of Damascus that has been besieged and bombed since 2012 by Bashar al-Assad’s forces and recently invaded by ISIS and the Al Qaeda–affiliated Nusra Front—hugs everyone around him, ecstatic to be alive. 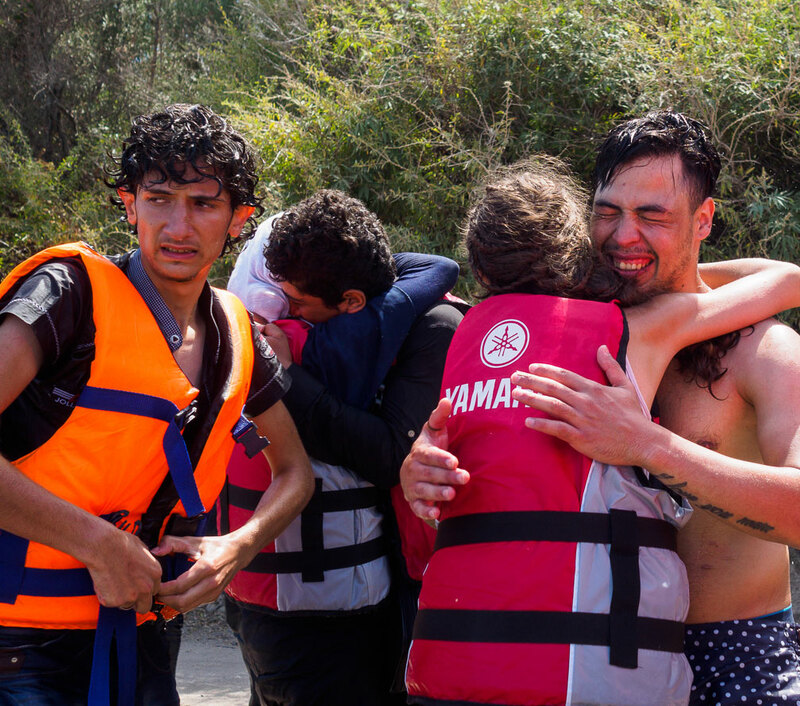 From the Greek shore, activists and locals had looked on helplessly as the boat’s motor broke down two miles away, water pouring into the barely floating rubber dinghy. Children and adults alike cried desperately for help, until they were towed to Greece by another boat of refugees coming from Turkey. Mouatash paid human traffickers in Turkey over 1,000 euros for this near-death experience, but as far as he’s concerned, it was a far less risky choice than continuing to hide out in deteriorating Damascus, which he’d abandoned for Turkey two weeks before. As a Palestinian who grew up in Syria’s refugee camps, he is stateless, but he has a brother in Paris and hopes to start a new life in France. He paces up and down the shoreline, unsure of which direction to go, while local activists try to bring the new arrivals together to tell them that they need to start a 40-mile walk to a registration center on the other side of the island. “Thanks to God I have made it here. I am free, I am alive!” Mouatash exclaims, overcome with emotion. Although he has escaped the horrors of Syria’s grinding civil war, Mouatash is just beginning the difficult journey through Europe. He will have to cross more borders illegally; rest in filthy, makeshift camps; pay traffickers to help him cross those borders; dodge border police; and sleep in parks and fields, before he can reunite with his brother. Still, Mouatash is one of the lucky ones. Four days after his arrival, a raft off the Greek island of Kos capsized and six Syrians—including a baby—drowned. 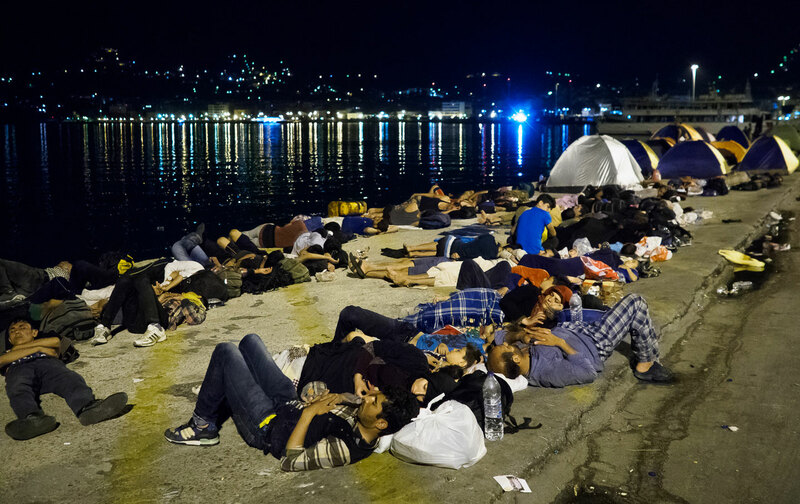 According to Lt. Eleni Kelmani, a spokesperson for the Lesbos Coast Guard, up to 2,000 refugees are now arriving daily on the island. She notes that this sunny tourist haven has seen the arrival of 75,000 of the estimated 120,000 refugees who have landed in Greece this year. Outside her office, hundreds of them sleep next to parked cars or in tents on the edge of the port. “It’s obvious that if austerity hadn’t hit Greece, things would be better for dealing with this crisis,” says Kelmani. She’s trying not to mince words, while attempting to keep the Coast Guard out of the domestic Greek political fray. Greece’s left-wing governing party, Syriza, is one of the few EU members to call for a “solidarity” approach across Europe to resettle the refugees arriving from some of the world’s worst conflict zones. It’s a position completely contrary to that of right-wing, anti-immigration, and nationalist EU politicians calling for a Fortress Europe that would make the journey for asylum seekers as difficult as possible in order to keep them from coming. However, with the Greek economy crippled by EU-imposed austerity measures, there is little the Syriza government can do to enact its call. 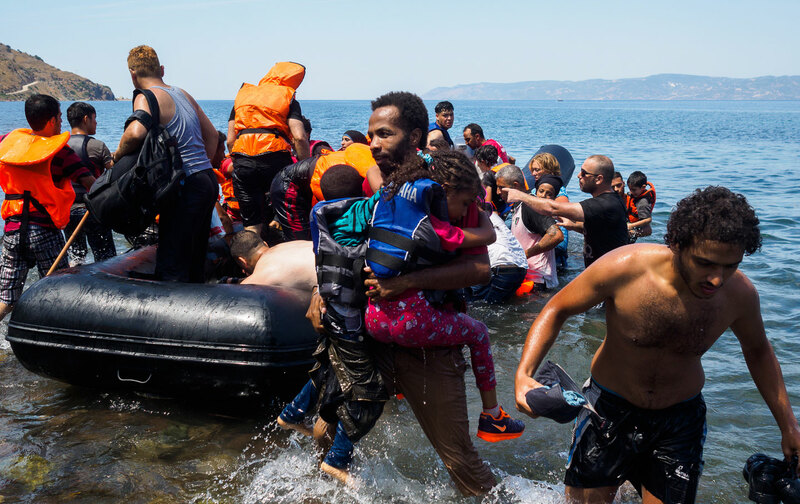 Instead of solidarity and a continent-wide, coordinated aid strategy, the refugees—the vast majority of them from Syria, Afghanistan, and, to a lesser extent, Iraq—are arriving on Lesbos only to find Greek state services collapsing under the strain. Young men as well as families—including mothers with children as young as a few weeks old—line the shoulders of highways on the 13- to 20-hour walk across the hilly island. Local laws prevent them from taking taxis, boarding public transport, or staying in hotels before they receive Greek papers, and there are only four buses to transport people to the two transit and processing camps, according to Kelmani. A handful of activist volunteers drive pregnant women, small children, and the elderly across the island, but most people have no choice but to walk. On the side of a blind turn, halfway between the northern part of Lesbos, where the refugees arrive, and the processing center near the main city of Mytilini, cars frantically swerve to avoid running over Abbas Bari and his friend Sayed Hassan. The two young men, from the southern Iraqi city of Basra, have fled militias and risked everything, only to nearly be killed while taking a nap on the edge of the road after walking for 10 hours. When I wake them up to suggest they move to a field, they are at first nervous and fearful, wondering if I am going to rob them. The difficult journey through Iraq and Turkey has left them trusting no one, but after I explain the situation and give them some water, Bari opens up. He had worked as a dog trainer for the Iraqi government and as a tattoo artist. Among the few belongings he brought with him are a large bottle of ink and a collection of tattoo designs, many of which he has etched on his biceps. But he says it was his training of guard dogs for the army that caught the ire of local militias, though he won’t specify which ones. “They killed one of my dogs and then made threatening phone calls to me,” he says, smoking an Iraqi cigarette from a pack he’d brought with him. Fearing for his life, the 29-year-old fled the city in a panic, leaving his wife and two kids behind. Now Bari hopes to reach Finland, where he plans to start a new life in safety, with his family joining him after he settles in. Still, he looks back on the destruction of his homeland with bitterness. He blames one actor above all else: the United States. “America killed the people and destroyed Iraq. They just came for the oil,” he says, citing the 2003 invasion as the source of the current chaos that forced him to flee. Despite their roles in creating this mass displacement, neither the United States nor its European allies in that war are doing much to take in the refugees generated by their failed occupation. As I’ve traveled with asylum seekers along their trek through Greece, where they exit the EU before attempting to reenter it from the Balkans, I’ve heard numerous similar stories from Afghans, whose displacement is rooted in the fallout from the 2001 invasion. And dozens of Syrian refugees have talked about fleeing their country because of the seemingly unending nature of the regional proxy war that’s tearing it apart. Although they blame Assad for his brutality, they equally blame the United States, Europe, and their Gulf and Turkish allies for flooding the country with weapons and fighters who have worsened the conflict. Yet in the transit camps on Lesbos, there is no sign that Europe will take responsibility for a political crisis that is driving thousands of people into these unlivable conditions. Instead, the job of taking care of the refugees has been left up to local volunteers and a handful of under-equipped NGOs. The result is two unmanaged camps on the island for everyone passing through. There are only a handful of toilets, which are overused and under-cleaned. Food is provided by local volunteers or sold at inflated prices by local food trucks and canteens trying to exploit people’s desperation. The only showers are taps attached to fences with no covers or stalls, so people wash in the open air for all to see. If people can’t find space in one of the few donated army tents, they either have to pay inflated prices for camping equipment or sleep in the dirt, with little shade and surrounded by the smell of thousands of others baking in the Mediterranean heat. It’s here that they wait for days, planning their trip northwest on smartphones and watching YouTube videos searching for tips on how to get around border police. “I have to think back to my time in Zaire [now the Democratic Republic of the Congo] at the beginning of the civil war to point to a time that I was in an unmanaged camp,” says Kirk Day, team leader of the International Rescue Committee’s emergency response team in Lesbos. He is shocked that after years of working in conflicts zones, the IRC is needed to help out in Europe. He notes that without money and a government willing or able to deal with the refugees generated by these conflicts, the crisis in Greece was completely predictable. “This is the most political I’ve seen [a humanitarian crisis get]. It’s a political hot potato,” contends Day. These tensions are as visible on the streets of Mytilini as they are in the EU Parliament. Local supporters of Greece’s fascist Golden Dawn party drive around the island, accosting refugees and the activists helping them. Many Greeks feel sympathy for the asylum seekers, but many others blame them for disrupting tourism and draining resources. Once people receive their Greek refugee-registration papers, they leave Lesbos as quickly as possible on ferries bound for Athens. 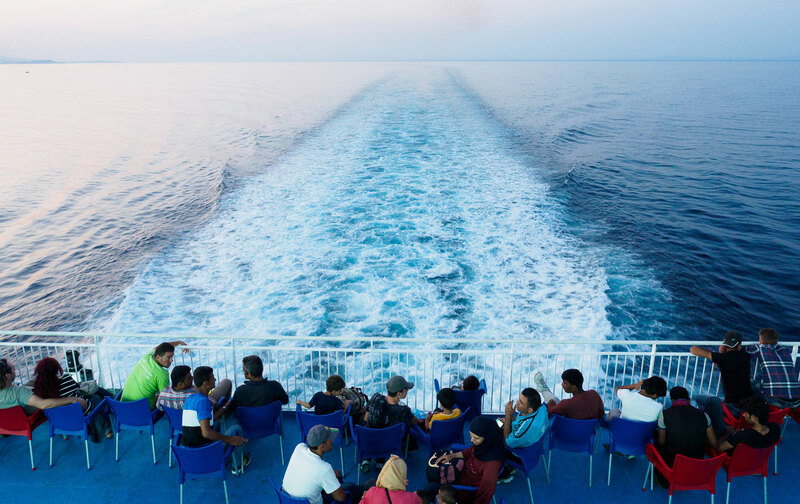 The decks of these massive ships look like a cross between a Mediterranean cruise and a war-zone evacuation vessel, as sunburnt tourists and asylum seekers scramble for the seats with the best view and coolest breeze. 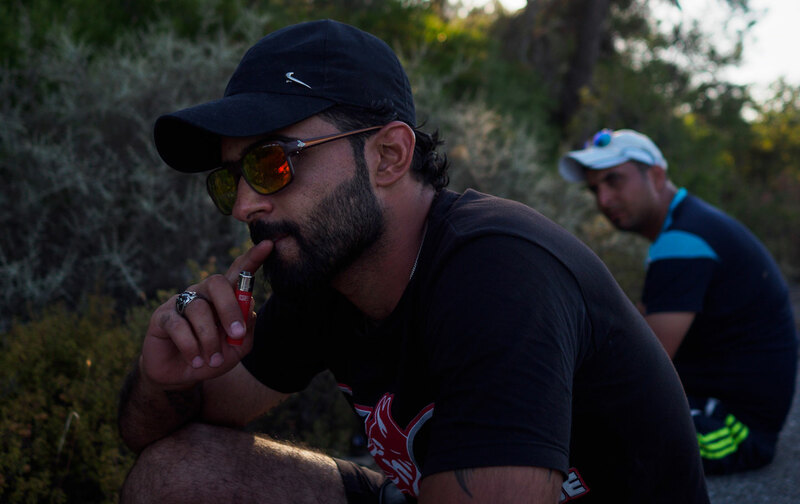 “I keep telling the guys that we are on a journey together,” says Johnny Mhanna, a 24-year-old actor from Damascus who fled to Beirut in 2013 to avoid conscription by Assad’s forces. He and his nine other traveling companions were finding it impossible to build a stable life in Lebanon, whose population has grown by a quarter from the Syrian influx while the government refuses to acknowledge that those fleeing the war are refugees. Unable to go back to Syria, they have decided to try to find stability in Austria or Germany. Still, if one didn’t overhear their conversation, it would be easy to mistake this gaggle of young men in handlebar mustaches and shaggy-top haircuts, sporting ironic English T-shirts and fiddling on their iPhones, as a hipster bachelor party. Once the ship docks in Athens, they head straight for the bus station. These asylum seekers, like many of the Syrians and Iraqis passing through Athens, hop trains and buses north to the coastal city of Thessaloniki the same day and then head for the Greek border with Macedonia as quickly as possible. 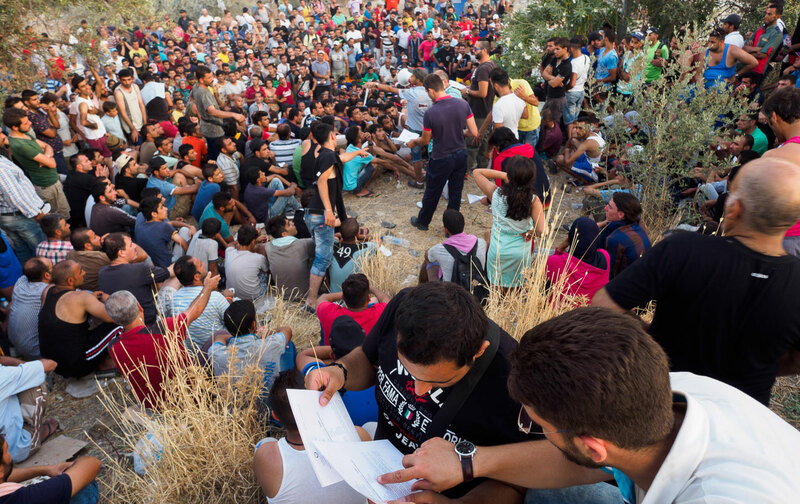 Many Afghans, though, stop in Athens to rest for several days and plan their next steps. For the most part, they have been on longer and more expensive journeys through Pakistan and Iran before reaching Turkey, and they have less money. Stories of being shot at by Iranian border guards and abused by Iranian police, army, and traffickers are common. “We were shot at by Iranian and Turkish border guards when we tried to cross. I was beaten by people smugglers and had to spend months working in Iran to make enough money to continue traveling,” says 34-year-old Mohammad Reza from Mazar-i-Sharif, Afghanistan. Traveling with nine other family members, he is from the Hazara Shiite ethnic minority in Pashtun Sunni–dominated Afghanistan, like most of the Afghan asylum seekers passing through Greece (according to both the IRC’s Day as well as all those in the Greek Afghan community I talked to). Reza describes fleeing both a resurgent Taliban and a government that persecutes minorities. For several days, Reza and his family camp out with hundreds of mostly Afghan refugees in Athens’ Victoria Park. One side of the once-manicured city garden is a refugee tent city, while the other half has long been an area where local addicts shoot up. The park was the only resting place that many refugees stopping in Athens could find, until the government opened its first emergency refugee transit camp in the city at the end of August. The overnight train from Athens to Thessaloniki might as well be called the Asylum Express. It’s the main route these days for people seeking refuge in Western and Northern Europe, one that takes them out of the eurozone after entering, into Macedonia and Serbia, only so they can sneak back into the EU in Hungary—where they can connect to their destination overland through the EU’s open borders agreement. The train sells out every night, and the platform is packed with a mix of refugees and local reporters jostling for a shot of hundreds of people swarming the train. Because of the Greek economic crisis as well as their experience in the islands, not a single refugee I have spoken to intends to stay in Greece, but their Greek registration documents are not considered enough identification to allow them to book flights to their intended EU destination country. That puts refugees at greater risk and puts more money into the pockets of human traffickers—like the ones who let 71 people suffocate in the back of a truck discovered in Austria last week. It was a question on the minds of thousands of asylum seekers camped out on a train-track border crossing between Greece and Macedonia last week. Riot police used force in an attempt to close the border, shooting at people of all ages with tear gas and rubber bullets. It was a hellish scene, reminiscent of images from the Great Depression in America, when police attacked destitute people in train yards. As people screamed and tried to push through the border, a group of German politicians from the Bavarian state legislature wondered around trying to make sense of the situation. They made no commitment to help the refugees, only acknowledging the difficulty of their situation while simultaneously expressing sympathy for Macedonian concerns. “It’s a very difficult situation, but Macedonia is a very small country,” said Martin Neumeyer, a state parliamentarian from the center-right Christian Social Union party, about those who want to pass through the Balkan country. Standing in the middle of a large crowd of Syrians and Afghans, he contends that Germany has already taken in too many people in comparison with rest of Europe. Both Germany and Sweden have taken in considerably more refugees than Britain, but for Neumeyer, the argument is used as a justification for Germany tightening its borders rather than finding a solution to resettle displaced people across Europe. As hundreds of people squared off with Macedonian riot police a few hundred yards away, 39-year-old Rawa Abdullah from Latakia, Syria, was incensed by Neumeyer’s comments. The English teacher and mother of three, who fled Syria last month, is desperately trying to reach Germany with her family. She had already been stranded on the border for four days. 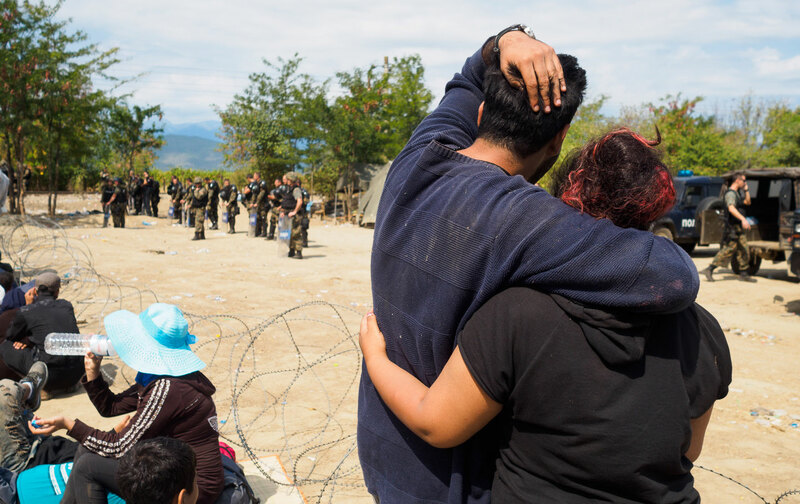 Later in the day, thousands were able to force their way through the police lines and enter Macedonia, but at that moment she felt simultaneously paralyzed and determined to continue traveling north.